ARW stands for Sony Alpha Raw - Sony Digital Camera Raw Image format. ARW file extension is used by three DSC series of Sony cameras, but the format mostly is associated with "alpha" DSLR series. ARW format is based on widely accepted TIFF format and TIFF specifications, which means that contains raw, uncompressed image data as captured by camera's sensors, and can be adjusted before exporting to common used image formats as JPG, PNG, GIF and others. Different models of Sony cameras may store RAW images using the same .arw extension, but their format can be different. That is because sensors that capture image data on different camera models are different and so the image data format can be different. Why to convert ARW to other image formats? ARW file format is RAW format which means that contains minimally processed data from camera sensors, and as that is not viewable for most of image viewers. That also means that is not supported by internet browsers and as RAW format can't be viewed directly on the browser. So, if you want your ARW image to share on social media websites or upload on your website or blog, you will need to convert to some other more popular and supported image format as JPG, PNG, GIF or other format. Why to use ARW Viewer? There are few viewers and converters for ARW images, but not all are free and provide good and quality converting. 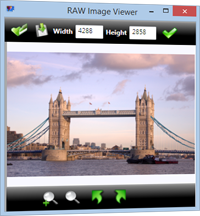 ARW Viewer is completely FREE software that support ARW image format and can open, view, resize and convert ARW images to other image format as JPG, GIF, PNG, BMP or TIFF. This viewer have a very simple user interface which makes it easy to use without advanced options that can confuse you and make converting difficult. Beside opening and view ARW images, ARW Viewer supports resizing, rotating and converting ARW images. It's simplicity lets you open, resize and convert ARW image in just few steps. Click on Open File icon on toolbar to locate and open ARW image. You can Rotate Image Left/Rotate Image Right by clicking on toolbar icons for rotating, or just put desired dimensions and click on Convert icon to resize ARW image. After you are done, click Save File icon to save image to JPG, PNG, GIF, BMP or TIFF. Also when you open ARW image there is an option to Zoom image or to fit on the display which will view full image depending of your dislay size. ARW Viewer is a free software and does not contain any form of malware, including but not limited to: spyware, viruses, trojans and backdoors. ARW Viewer have a very simple and easy to use user interface, and uses only libraries that need for processing. This provides fast and stable work of the application. ARW Viewer is very simple and easy to use. You just need to open ARW files, rotate or resize and click Save File. In the Save File dialog you will be able to select from given formats to which one you want to convert and save opened ARW image. Microsoft .NET Framework 4 (included in Windows 7 and Windows 8). ARW Viewer Supports: Windows RT; Windows 8; Windows 8.1. ARW Viewer is a combination of all these RAW viewers mentioned above and beside ARW also supports other RAW image formats as CR2, CRW, NEF, RAF and DNG.